Campeggio Le Clos Auroy si trova a Orcet, Puy-de-Dôme, è situato fiume/torrente. Il campeggio a terrazze dispone di piazzole delimitate e piazzole poco ombreggiate. È possibile affittare casemobili. Il campeggio dispone di un parco giochi e di un campo sportivo. Per gli sportivi, il campeggio prevede un programma di escursioni. Per chi desidera rilassarsi dopo una giornata intensa ci sono idromassaggio. Il campeggio dispone di un parco acquatico, una piscina scoperta e una vasca per i più piccoli. C'è anche uno scivolo d'acqua presente. Ogni anno un ispettore visita il Campeggio Le Clos Auroy, controllando oltre 200 tra attrezzature e altri punti di interesse del campeggio. L'ispettore è un dipendente ACSI e non lavora per il campeggio. Stopped in November 18, only 2 vans on the site. Nothing in the town open, just a bakers and supermarket. Little to see in small town. Unisex indoor facilities, hot water. Facilities tired. Close to motorway. Having stayed here before, we returned for an overnight stop. Both of the owners pleasant and helpful.ACSI is not accepted during the winter months. As it was in the winter period the toilet block was unisex.lashings of very hot water available and a rarity in France hand wash and toilet seats WELL DONE. Madame was most helpful in getting a vets appointment for that same day 1 hours notice for our dogs so as to be able to return to UK having been messed around by a vet in an other area. Stayed late March for one night greeted my friendly helpful staff. We were struck by how well maintained and clean the whole site was. Toilet blocks spotless, with modern fittings. Water very hot for washing up dishes the same could not be said for the showers which were at best Luke warm tepid. Yet another site where the WIFI during the evening was virtually non existent. Recommend a visit to the village bakery for her what I could best describe as her almond covered cakes and cereal bread. Would definitely return. Visited for one night in February 2017. Site in winter mode so everything except one set of showers/toilets closed. No bread available either. Pitch very good and WiFi adequate (€3 for 24 hrs). ACSI discount only from 1/4/2017. However, no motorhome fill up services as all taps were either disabled, removed or shut off. Motorhome service point also disabled - disposal only. Shower temperature reduced from previous year resulting in a tepid shower. Very expensive for what you got on this particular date. Very pleasant site with excellent facilities that are clean and well maintained. Pitches are grassy, flat, spacious and divided by hedges for privacy. The site is quiet and night with no noisy entertainment. Would definitely return to this site. We could not believe the off hand way we were spoken to by the man in the acceuil when we arrived. I can think of no word to describe him other than rude. He spoke rapid French and made no attempt to speak slowly to make it easier for us to understand him. The pitch was fine for a night stop but would not want to stay longer as the pitches were divided by very tall cuprous trees. The showers etc. were spotless clean with abundant hot water. Stayed for one night. Nice pitch and campsite. Bar pool snack bar etc. bread man at 9am . Nice friendly site . Beware of the showers though red hot with just a push button no control over temp. Far to hot to stand under so be careful with kids. Overnight stay on route South. Great as site is just off road. Places near to buy supplies. Lovely view of the valley. Very attractive and well maintained site with good sanitary. None of the fresh water taps were turned on during our visit in mid-February. 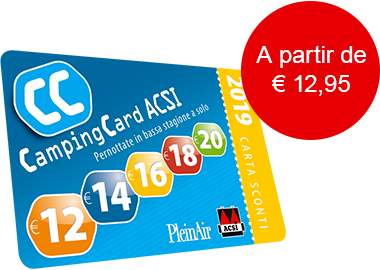 Be aware, ACSI discount does not apply until April. Orcet village is very attractive and there is a boulangerie and mini market there. Visited for overnight stay the first week of November 2014 on route north, toilet facilities are good but due to the high hedges the pitches were damp. It appeared that levelling ramps would be needed in some areas. Although it was low season ACSI was not excepted per night, other than toilets, water and electric there were no other facilities available. Volete prenotare il Campeggio Le Clos Auroy o oppure saperne di più? Potete farlo usando i seguenti dati. A 2,5 km da autostrada A75 Clermont-Ferrand/Issoire. Uscita 5 verso Orcet/Cournon. Poi seguire cartelli camping. ACSI Eurocampings invia la tua richiesta di informazioni al "Campeggio Le Clos Auroy".